Service Pack 1 for Windows Vista couldn’t have arrived soon enough; this is only exacerbated after I realised that the “Hotfixes and Security Updates” document was 77 pages long. 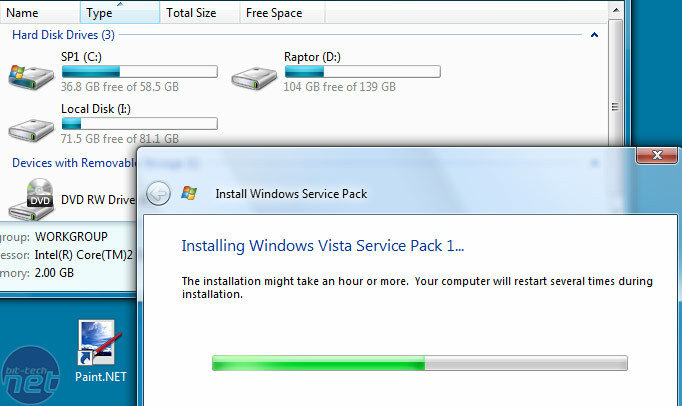 Microsoft generalises these improvements in its “Overview of Windows Vista Service Pack 1” document which details several sections under the broad compass of compatibility, reliability, security and performance. So while it’s always worth installing the Service Pack for these other parts—especially security and reliability—but what cost or leverage do these other fixes have on performance? Yesterday, we evaluated Windows Vista Service Pack 1 gaming performance and found that the improvements were small at best. In fact, in some cases, we found that performance was actually lower—by up to 10 percent—and that’s not good news for anyone that was waiting for “magical” improvements in Vista gaming performance. Addresses an issue in the current version of Windows Vista that makes browsing network file shares consume significant bandwidth and not perform as quickly as expected. Improves the performance of copying files. In internal tests, copying files from one folder to another on the same local disk was 25 percent faster. Copying files from a remote computer that was not running Windows Vista SP1 was 45 percent faster. Because of networking improvements in SP1, copying files from a remote computer that was also running Windows Vista SP1 was as much as 50 percent faster. Improves the progress estimation when copying files by using Windows Explorer so that the time estimate in the progress window appears within two seconds. Improves the speed of adding files to and extracting files from compressed folders. Improves the performance of power transitions (for example, resuming from hibernation and standby mode). Improves the performance of domain-joined computers when operating off the domain. Before Windows Vista SP1, users would experience long delays when opening the File dialogue box. Improves battery life on some computers by reducing CPU use and redrawing the screen less frequently. Improves the logon experience by removing the occasional 10-second delay between pressing CTRL-ALT-DELETE and the password prompt appearing. Reduces the time to return to a user’s session when using the Photo screensaver. In internal testing, reduces by approximately 75 percent the time to start Event Viewer. Support for UEFI firmware on the 64-bit versions of Vista. Adds support for Direct3D 10.1, an update to Direct3D 10 that extends the API to support new hardware features, enabling 3D application and game developers to make more complete and efficient use of the upcoming generations of graphics hardware. The relevance is quite significant: DirectX 10.1, UEFI, better DVD, Blu-ray, HD DVD, Digital Tuner and content protection support, as well as Media Center Extenders.